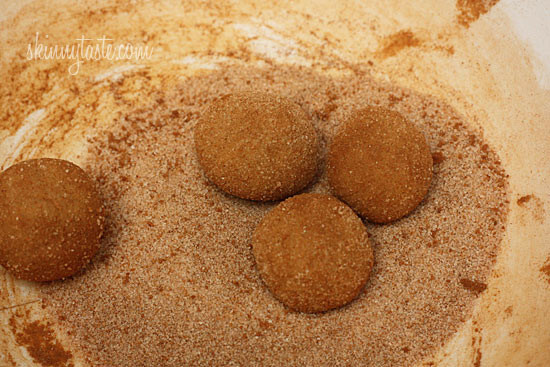 Skinny whole wheat snickerdoodle cookies coated with cinnamon, spice and everything nice! If you have plans to do some baking this weekend, these cookies are a must! More of my favorite healthy holiday cookies are Dark Chocolate Oatmeal Lace Cookies, Skinny No-Bake Chocolate Peanut Butter Cookies, Nutella Almond Butter Cookies, and my classic favorite best low fat Chocolate Chip Cookies. These are the perfect cookies to add to your holiday baking. 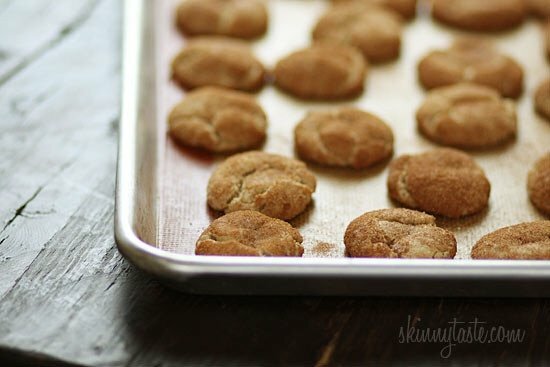 I even love making a Pumpkin Spiced Snickerdoodles version for during the Fall season! I absolutely loved these cookies which I adapted from Cooking Light magazine. I swapped the flour for white whole wheat and the corn syrup for agave and they turned out too darn good if you know what I mean! When I was in DC a few months ago, I met Matthew Petersen, the executive Pastry Chef of CityZen and Sou’Wester at the Mandarin Oriental and “chef’testant” on Bravo’s Top Chef Just Desserts, and he was a huge fan of King Arthur flour. I’ve been using it since and always love the results. Line two baking sheets with Silpat mats and spray with cooking spray. Combine 1 cup of sugar and butter in a large bowl; beat with a mixer at medium speed until well blended. Add the agave, vanilla and egg; beat well. Gradually add the flour mixture to the sugar mixture, beating just until combined. Cover and chill for 10 minutes. In a medium bowl, combine 3 tbsp sugar with cinnamon, stirring with a whisk to combine. With moist hands, shape dough into 42 (1-inch) balls. 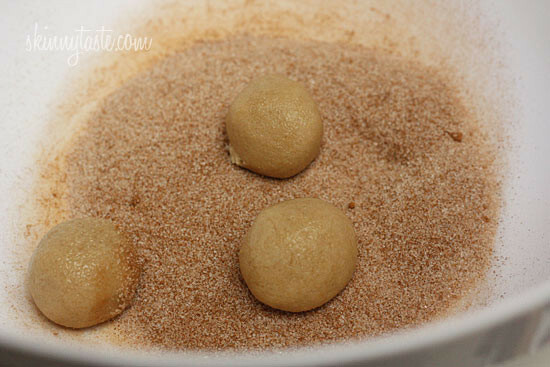 Roll balls in sugar/cinnamon mixture. Place balls 2 inches apart onto baking sheets (I slightly flattened them). Bake 375°F for 5-7 minutes (cookies will be slightly soft). Remove from pans; cool completely on wire racks. I discarded 2 tbsp of the sugar cinnamon mixture so I deducted 1 tbsp sugar from n.i. to play it safe. Got two thumbs up! Mine were not crumbly and I didn’t use moist hands. I made sure that all my ingredients were room temp. I followed the advice that said to spoon the whole wheat flour into measuring cup. I “scraped” the dough together with a spatula before chilling. Made 35 cookies and only needed 1 Tbsp sugar mixed with 1 tsp cinnamon for mixture. I also put the dough in the frig while batch was in oven. I was concerned about the crumbly statements and worried about using moist hands. Didn’t need to be. Worked perfectly. These were great!! Mine came out crumbly as others were saying, but when I rolled them with moist hands, it worked out well. I didn’t have cream of tartar so I substituted the cream of tartar and baking soda for 1 tsp baking powder + 1/4 tsp baking soda. Mine didn’t spread very much, but they came out soft and delicious!! I’ve made these several times but always the day of – can I freeze the dough to bake later? Or will that damage the texture and flavor? Does anyone have an issue with the time?? I’ve made these cookies four times now and every time they are still completely raw dough in the middle even after like ten minutes. It’s really frustrating me. The first two times they were okay because I didn’t take them out multiple times thinking they were done but the next two times I had taken them out 3 or four times in hopes of not burning them/ making them hard and it was a bust. Every time you open the oven the temperature changes, seems like you didn’t let them cook long enough? Just wanted to say that this recipe has been our cookies for Santa Clause the last two years. Thanks for being a part of our holiday tradition. i just recalculated these cookies , and they came out to 2 smart points each cookie, Even better! Can I use the Bob's red mill gluten free mix with this? My niece has a lot of diet restrictions and I always feel bad making things that she can't eat for family parties. Thank you Gina! These look great! Do you think I could make half of the recipe and still have them turn out? made these, turned out perfect….lovely dessert, will have some with chai green tea tomorrow a.m. …… gracias!!!! I just made them with whole wheat flour from our mill (I'm from the Netherlands and I have a working mill in my town). And they're yummy! Although I prefer crispy cookies…The next time I'le try a longer oven time to find out if that will work. These turned out great! I changed the recipe a bit to make these even healthier!!! Replaced the butter with a mashed brown banana and reduced the sugar to 1/2 cup because of the sweetness of the fruit! Finally just replaced the egg with egg white. Making these fat free and only 29 calories each!!! Could even replace the sugar with splenda to reduce it further!!! Also i recommend adding cinnamon to the dough! I made these on a whim tonight. I only had whole wheat flour, so I went ahead and used that instead of the King Arthur whole wheat white flour. They still turned out wonderfully! I think they flattened out a little more than they would have with the King Arthur, but they are delicious, nonetheless! I also used honey instead of agave nectar. My boyfriend is highly opposed to consuming anything 'skinny,' 'light,' 'low-fat,' etc. He also lacks a sweet tooth of any kind. Thus, I was amazed when he ate two of these cookies and went back for one more! Thanks for all your wonderful recipes. I've been following your blog for about three years now, and I have made and enjoyed many of them! I LOVE THESE COOKIES! I was planning on sending half the batch to work with my husband, but he said they were too good to share 🙂 AND that he couldn't even tell that they were whole-wheat! Just add water to prevent crumbling. Cookies form great and taste great too! Dang! These did not turn out. Too crumbly. Boo!! We don't have the King Arthur brand here in Canada. The closest substitute I see for this is the Robin Hood Best for Bread Whole Wheat . I'm looking forward to making these but I don't want to mess up by choosing a wrong type of flour. It would be great if I could get any help on this. Thanks. I just had the same thing happen to me and I don't know how to remedy. I tripled the recipe and DO NOT want to throw it out. Should I add more wet ingredients? Hi Gina! I just baked these and omg the cookies are great. But my dough was really dry and crumbly and I am not sure what I did wrong… :/ followed your instructions! Otherwise, the cookies are really nice and I will totally make this recipe again. Has anyone frozen this dough to use later? I want to make the dough in advance. I baked these last night and didn't change a thing. I think the cookie is delicious with little deviation from the traditional sinker doodle. Planning to make these tonight, after reading all of the comments, I wonder if the humidity of the area has an affect on how well the cookies stay together? I know for baking bread, dryer climates require slightly more liquid. Just a thought. 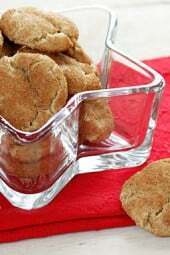 I substituted the agave for honey and the cookies still turned out delicious! (they did have a slight honey taste, but that didn't bother me) But if you are subbing honey, I would recommend baking them a little longer than 5-7min. But great recipe! Totally a keeper! These are awesome! I used raw honey and bourbon vanilla….so, so good. Given that agave is actually higher in fructose than high fructose corn syrup, I would NOT recommend its use in any recipe wanting to be "skinny". Natural organic raw honey is your best bet for a sweetener, as it is unrefined and rich in antioxidants. Do these snicker doodles have to have King Arthur's white whole wheat flour? Can I use Bob's Red Mill whole wheat flour (not white)? Also, I do not have agave, can I exclude it? Please answer! I mixed the white flour with some whole wheat and used honey…they were delicious!!! This recipe is great. My husband said he doesn't usually like these kinds of cookies, but he likes this recipe. I use your site a lot to plan our meals for the week. It's been a huge blessing. Thank you for taking the time to post it all. these are AMAZING!!! I could only make 16 though…. I really think the balls I made were wayyyy too big… but they seemed like the same size as on the pictutre…! Anyways thanks for this recipe, im loving it! The cookies taste really good and it didn't turn out like the ones in your picture. I probably did something wrong. But nonetheless, they were still really good. Just made these and while they taste great, I had a terrible time getting them to hold together. I moistened my hands too but I must not be coordinated enough. I'm so excited to try this recipe! Used natural apple sauce for butter and egg beaters as I am lactose intolerant and trying to lower choleaterol. The cookies were still delicious. Ohhh, sooo good. I hope they don't taste good frozen, because I intend to freeze them so I don't eat them all and thaw a couple at a time. What can you use in place of agave? Can you sub coconut oil for the butter? I agree with blue, mine stayed soft for a week since I made double batches. They were kept in an airtight container… And the aftertaste I think is just part of the snickerdoodle flavor. Hmmm, mine were great and stayed soft and chewy for at least a few days after (and they didn't last any longer than THAT, they were so yummy). Maybe you baked them too long? As for the aftertaste, I have a friend who doesn't like any snickerdoodles because he says they have an aftertaste, so maybe this is just not the cookie for you? I didn't find them to have an unappealing aftertaste at all. These cookies were good right out of the oven but two days later they were pretty dry, hard and there was a noticeable cream of tartar after taste. I tried a second batch with the same results so maybe I am doing something wrong? You didn't do anything wrong, the dough looks crumbly when mixed, but when you wet your hands it holds it all together. The trick is most hands to roll each cookie! I tested them again using a little less flour, it was also good but the recipe as is works fine, I re-tested to be sure and took more pics which I will upload soon. My dough was crumbly, too, but did come together into the small balls fine with moist hands. The second time I made them, after I finished beating the dough and before I chilled it, I gave it a little massage with my hands to make it into more of a cohesive unit, and that seemed to help quite a lot. Also, I learned a trick from another recipe to spoon flour into the measuring cup with a teaspoon or tablespoon, then level once it's overflowing. When you use the measuring cup to scoop flour out of the bag or container, it can end up using too much, because it becomes packed and dense in the cup. That may be a part of the reason some people got excessively crumbly, dry dough… just a thought! My parents and I are huge snickerdoodle fans, growing up my dad always called them "little lard balls" due to the Crisco his recipe called for. 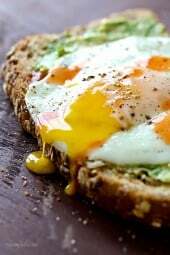 We are all trying to watch our weight these days, so I was thrilled to find this recipe! I made it for Christmas Eve. I am pretty sure I followed the recipe completely, but my result of dough looked more like a pail of sand. It did clump together, but didn't seem as though the balls would hold up to tossing in cinnamon and sugar or baking. I also added 4 tablespoons of unsweetened apple sauce. They still turned out dry and more dense than I would have preferred. Any idea what I did wrong? I used King Arthur whole wheat flour, it didn't say anything about being white, but I didn't think bleaching the flour should make a difference. The dough was VERY crumbly for me as well. After tasting the first batch, I added a half cup of apple sauce. It made the dough easier to work with and I think improved the taste a bit too. The cookies still taste a bit plain to me but my they are a hit with my daughter! Having the same issues with crumbly dough, glad to hear they come together with the moist hands…I've been trying to figure out what I did wrong. My dough came out very crumbly. They ended up coming together when rolled with wet hands but is it supposed to be crumbly? You can use green and red sugar sprinkle sugar to make it more festive. Super delicious recipe! Going to let Santa try them this year. These are great–just made them. Hard to judge size, though until I get a ruler with me (LOL). I was a little short, but practice makes perfect. I don't have silpat… is it okay to use parchment paper? Or just my nonstick cookie pans? I've never used spray on my silpat. Have you tried it without spray? Just wondering what the results will be. Chicago area: King Arthur flour is on sale in the at JewelOsco – I just loaded up on it! King Arthur is the best! I ways use light agave, it's just a preference. So glad you all liked them! Santa will be very happy! I know what Santa is getting Christmas Eve! Can't wait to make them!! Snickerdoodles are my favorite too!! 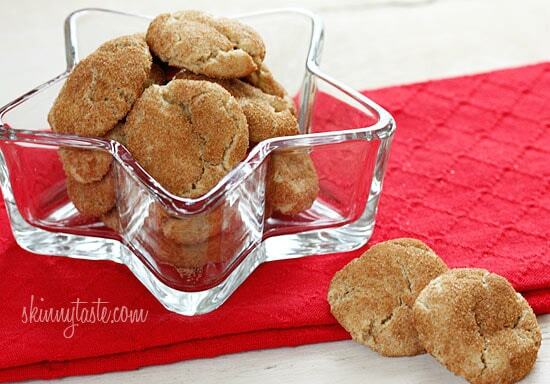 Oooh, I adore snickerdoodles and this whole wheat version looks wonderful! I am a huge fan of agave, I bet it is great here! 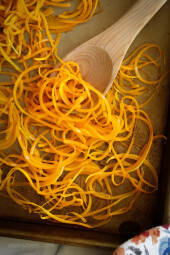 Do you use amber agave or light agave? Of course, I had to try one or two (so 6 dozen for tomorrow night's event). YUM!!!! Definitely awesome! snickerdoodles are delicious. now, even better i am going to cook them.thanks!! I saw this recipe and ran out to the store immediately to get all the ingredients! I found agave at Wegmens for those who couldn't find it. I agree, there is nothing like a homemade gift. Agave is right by the honey with the peanut butter and jelly. I made this but used all agave (2/3 cup) instead of sugar. 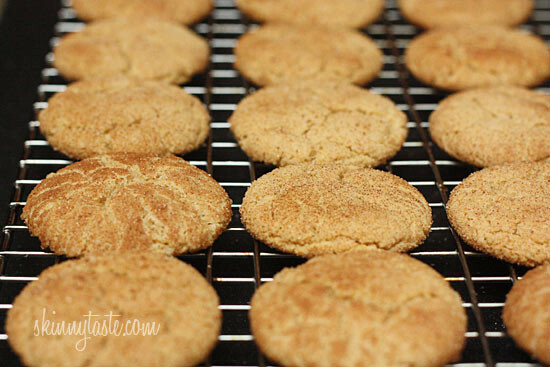 They taste lighter than your normal snickerdoodle, but I really enjoy them! I bow my head down to you, an awesome cookie for 50 calories. On my list for the weekend!!! I'm so excited I bought king Arthur without knowing its preferred & I have agave (Costco sells 2 packs) but I'm out of cream of tartar – any subs for that?? My daughter recently introduced me to King Arthur flours. Where have I been? It IS different from the others and superior. The white whole wheat flour is now my "go to" flour. You are so on the mark, Gina! OMG Snickerdoodles are my favorite. I will have to try this! 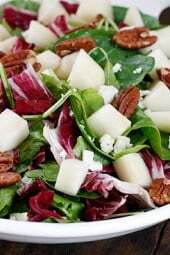 This blog looks like a great resource to keep me eating healthy, but tasting happy. Thanks for the helpful resource. 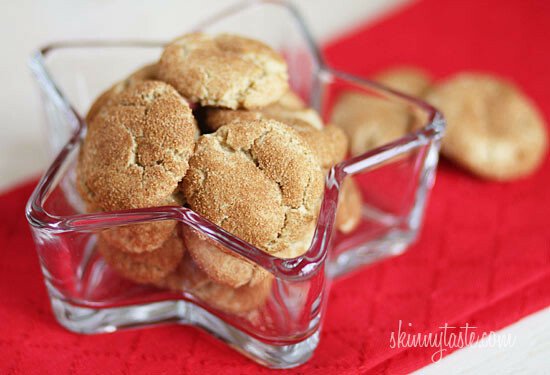 OMG I have weigh-in tomorrow and snickerdoodles are my FAVES…I am dying over here! The point values haven't changed, I'm still using their calculator. I made these tonight with my son. It was so much fun rolling the dough with damp hands and dipping them in cinnamon sugar. We could only make about 32, but they are delicious. I will be giving the rest to my family coming into town so I don't eat them all! I will absolutely make this ASAP. I just need to figure out how not to eat all 42 cookies first (even though they are skinny). These look wonderful! Since the points plus program changed as of last week, do ur recipes and calculations reflect that change? I have got to get some agave! I have even seen it at Publix, I will pick it up this weekend. I can't wait to start baking. I never bake because I feel like it is unhealthy, but you have really inspired me. I have yet to find agave and always substitute in honey for all of your recipes. Works great for me! I love snickerdoodles! THANK YOU! The printerfriendly button is there for me, right below the recipe. Mellybelly- Corn syrup, maybe even honey? Gina, these look amazing! Is there anything that I can substitute for the Agave? I am not too sure where I can find it! Dang, I thought I was doing good getting mine down to 60 calories per cookie! I'll have to give yours a go in a few months when I'm not in a dough coma! The printer friendly button seems to be missing. Trish, I didn't try in with pastry flour so I'm not sure… I think to play it safe, do a blend of white and whole wheat flour. You can use regular white whole wheat, are even all purpose white if you have to! Snickerdoodles are my absolute favorite cookie!! But, I live way out in the country and our shopping center doesn't carry King Arthur white whole wheat flour is there a substitute? Maybe order it online? I MUST Make these cookies!! OH I would SO make these right now but all I have is whole wheat pastry flour and whole wheat flour! Do you think either of those would work? I love love love snickerdoodles! There is a sandwich shop around the corner that sells them but now I can make my very own and my children will love them! I also can't wait to make these and package them up for Christmas gifts! Oh snap, that looks so yummy! Snickerdoodles are my ultimate favorite!! 50 cals a cookie, I won't feel so bad going for thirds. Plus swapping out sugar & egg for splenda and egg substitute may give me the chance for 4ths! I love snickerdoodles. They smell amazing when they are being baked! I like that this is a whole wheat version! have a wonderful weekend!